Some movies are stories that need to be told, and not just Oscar plays. Especially now, 70 years after the events portrayed, with many of the players long gone, we need to remember how important master works are, and the lengths that need to preserve them and continue their creation. The Monuments Men is a 2014 American-German war film directed by George Clooney, written and produced by Clooney and Grant Heslov, and starring Clooney, Matt Damon, Bill Murray, John Goodman, Jean Dujardin, Bob Balaban, Hugh Bonneville, and Cate Blanchett. 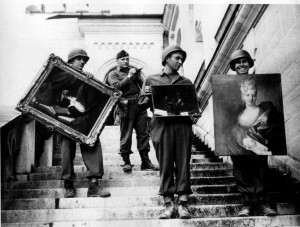 Loosely based on the non-fiction book, The Monuments Men: Allied Heroes, Nazi Thieves and the Greatest Treasure Hunt in History, by Robert M. Edsel, the film follows an allied group, the Monuments, Fine Arts, and Archives program, tasked with finding and saving pieces of art and other culturally important items before their destruction by Hitler during World War II. Although the film is based on real events, the names of all characters are changed, and a number of further adjustments to the historical facts were made in the interests of drama. Clooney is quoted as saying “80 percent of the story is still completely true and accurate, and almost all of the scenes happened”.